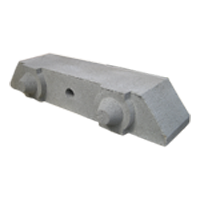 The Terrafix concrete block system is comprised of a varying range of concrete blocks at different sizes and weights, each designed for different applications. Terrafix concrete blocks interlock forming a mattress to prevent surface erosion of exposed soil. The mattress articulates to conform to the sub-grades profile. It is the only product on the market that provides mechanical interlock in three axis. The product is ideal for: River bank protection, shoreline protection, open storm water channels, boat ramps, access tracks and general slope stabilization.